This classic quiche recipe is the perfect vehicle for using up leftover roasted vegetables. The vibrant colors and flavors of this delicious quiche are sure to become a family favorite. Being an impressive centerpiece, this roasted vegetable quiche also makes a gorgeous Christmas or other holiday or special event main course ​for vegetarians. If you can’t find pouring cream (20 percent butterfat), try the next best thing. In the States, that would be half-and-half (18 percent butterfat). So what is a quiche? At its most basic, it’s a savory cheese custard pie that can be made with a staggering variety of fillings—ham, bacon, onions, mushrooms, shellfish, asparagus or other veggies, and the list goes on. Heat oven to 350 F (180 C). Place a baking tray in the oven. To make the pastry shell: Use pastry to line base and side of the fluted flan tin. Gently press the pastry up against the sides, making sure there are no air bubbles. Trim to fit. Prick base with a fork. Place in freezer for 15 minutes or until firm. Line pastry with foil and add baking beads or uncooked rice to bake blind. Place tin in on the baking tray in the oven and bake for 10 to 15 minutes or until golden. Remove from oven. Carefully remove foil and baking beads and set pastry shell aside to cool. To roast the vegetables: Spread out vegetables in a large baking dish. Coat well in oil and season with salt and pepper. Roast in the oven for about 25 to 30 minutes until very slightly charred. Set aside and cool slightly, separating the onion layers. 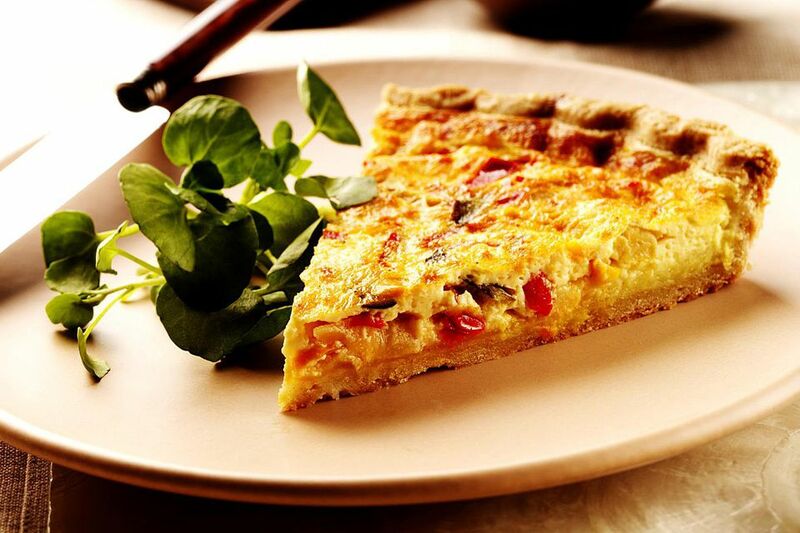 To make the quiche mix: In a large mixing bowl, whisk together the eggs with the milk and cream. Stir in the cheeses, parsley, and salt. Transfer egg mixture to a jug. Spread the vegetables over the bottom of the pastry shell (which is still on the baking tray to catch any drips during baking) and carefully pour the egg mixture over. Bake for 30 to 35 minutes or until just set.